This book was the perfect summer read. 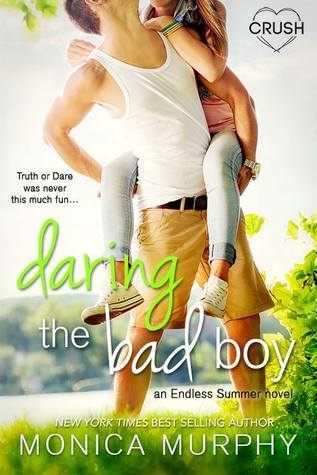 Daring the Bad Boy was charming, funny, and adorable. I had such a fun time reading this book! I really liked the summer camp setting in this book. The summer camp created such a fun atmosphere for the characters, and it lead to some really sweet moments for the main characters. I really liked the main female character, Annie. I thought Annie was sweet, caring, and very relatable. I enjoyed watching her grow into a more daring person. One issue I had with her character was that her development seemed a little sudden. She became very bold very quickly, and I felt like that should have taken more time. I thought the change was nice, but I would have liked to see it develop at a slower pace. There was one thing that Annie did near the end of the book that annoyed me beyond belief! She did something behind Jake's back, and I wish she would have just discussed it with Jake more. Everything ended up being okay, but Annie still really annoyed me with her one action. Jake was such a heartthrob! He was such a charming and adorable character. Since he was labeled as a "bad boy", I was expecting him to be more of a jerk. However, he really wasn't a jerk at all. He was a little standoffish at times, but he was never as mean as I assumed he would be. I really enjoyed his character! I want my own Jake. The romance was sugary sweet. I thought Jake and Annie were so cute together! I loved all of their romantic moments together. Their romance was everything I wish I had when I was their age, and what I wish I had now! One thing I didn't really like was Annie's crush on Kyle. I understood that she thought he was cute, but it didn't make sense for her to like him! It annoyed me that she liked him at all. I am glad it didn't last the entire book, because it was very obvious that she was suppose to be with Jake! Overall, this was a fun and entertaining read! I would recommend this to anyone looking for a cute summer read.